He made the Church glad in his works, and his memory shall be forever blessed. I suspect that any novice, reading the Summa for the first time, doesn't exactly feel glad over the works of St. Thomas. In fact she most likely has this dreadful feeling that she wishes it never existed and only knew of St. Thomas' beautiful Eucharistic hymns! The Summa Theologica is not St. Thomas' most important work but aside from his hymns for the Feast of Corpus Christi it is probably the best known. Not known content-wise but known for the influence both philosophically and theologically in the Church. Pope after Pope has recommended that his integrated method of philosophy and theology be taught in seminaries and schools. St. Thomas isn't just for Dominicans but for the whole Church! 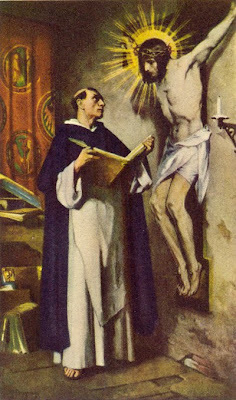 We Dominicans feel especially blest to have St. Thomas as our brother and to have his way of theology as our own. Some people like to do to St. Thomas what has been done to theology: fragment and disintegrate him into the St. Thomas of the Eucharistic hymns (the pious St. Thomas) and St. Thomas of deep and profound and often seemingly dry philosophy and theology (the brainy St. Thomas). In fact, who St. Thomas was teaches us how we are to be. All study and learning is not for it's sake but to lead us into Trinitarian communion. This is exactly why we Dominicans are very uncomfortable around such terms as "Dominican Spirituality" or "my spiritual life" "my prayer life"! No, St. Thomas had a profound and postive understanding of the human person as an integral whole. It is the whole person that God leads by grace to union with Himself! St. Thomas was convinced that we are created for nothing less than everlasting communion with God! "Nothing but yourself, Lord!" St Thomas responded to our Lord when he was asked what reward he wanted for speaking so well of God. Looking through the lens of this desire we can understand something of the genius and holiness of Thomas, the dumb Ox which is why for over 700 years we recall his memory with joy...and feasting!